Last night was probably the best racing we’ve encountered on Strategery. It was a photo finish, with only 5 seconds separating the top 3 finishers in the J105 class, and less than a second separating first and second place. On board was the usual crew: Mike on Bow, Jim on Chute, Kim as Squirrel, Jim on Jib/tactics, Dewey on Main and Cliff on Helm. We didn’t race last Tuesday (Race 11) due to a lost main halyard. After Mike went up the mast twice, bruised the hell out of his body hanging in the air, we were back in sailing shape. The full fleet was on the line…Marlen, Strategery, Uproar, Jabberwocky and Ubuntu for the 105’s and the 8 other boats we share the starting line with racing in their PHRF fleet. The breeze was an unexpected treat, with a consistent 13 to 15 knots true wind showing on the instruments. Our strategy was twofold…priority one was placing higher than Marlen (currently in first place). Priority two was to get to the right side of the course in clear air. This meant starting at the committee boat end of the line and tacking over to port. Our hope was the current that was coming out would lift us towards the mark. The course was upwind/downwind, 2 times around with a downwind finish. Roughly looks something like this. 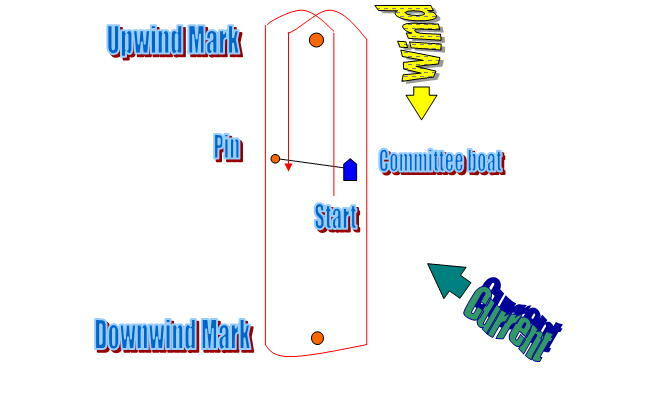 The start was a little dicey with the pin end being favored by about 5 degrees (was about 5 degrees closer to the upwind mark…meaning you sail a shorter course by starting there vs. at the committee boat). That said, the line was short, and we believed that we’d be better off getting the most benefit from the current and clear air. We did a triangle start, and came in on starboard behind Veladare to the line. Our goal was to be the boat closest to the committee boat so we could tack away as soon as possible. It was pretty tight, as you run the risk of getting “squeezed out” by the boats below you. Until the gun goes off, they have the right to luff up forcing you into the committee boat. We were damn close, but we made it clear and tacked away after passing K2, a boat that found itself on port tack above the line…not a good spot for anyone to be. Tacking away (per our strategy), we watched the rest of the fleet sail out to the left hand side of the course. This is typically not a great thing… If everyone is going one way, and you go another, it is pretty risky. One, you essentially assume that you know better than the collective experience of all the sailors on out there (way too egocentric for good performance), and two, you risk getting out of phase with the other competitors in the J105 fleet. In one design racing, it’s all about the order of finish, not how fast you sail the course. So…we were pretty sure we had screwed up, but were in good breeze and were definitely getting good help from the current. The one hope was that the other boats were pinned by the fleet and were unable to come with us. We decided to stick to our plan and see what happened. Eventually, they started to come over on our tack. Uproar, then Marlen, then Ubuntu. The only one who was late to come over was Jabberwocky who had a great start and was leading the pack of boats that went left off the line. Rather than sailing too far out, we decided to tack over and see how we did. Turns out, we got our first piece of luck and did pretty well, crossing Uproar by about 10 lengths and Marlen by about 5. We covered Marlen per our strategy, and they tacked back away to the left side of the course. We sailed out to cover Uproar who was above and behind us, and tacked over to go to the mark. At this point, Jabberwocky sailed over us and tacked onto our air. We rounded the mark behind Jabberwocky, but ahead of Marlen and Uproar. We jibed over and started our downwind run at the mark. We sailed fast, surfing waves downwind and keeping pace with the other boats. With the current pushing us toward the mark, we were able to sail a fast angle on Port tack to get us to the mark without another jibe. Marlen was fast on this downwind leg, but we were able to keep pace and even make a bit of ground up on them. Mike helping on the jibes, Jim trimming the sails and Chris calling the tactics paid off. Successfully dousing the sail with Mike and Kim wrestling the chute down, we rounded the mark and headed upwind. Marlen tacked, as did Jabberwocky to cover them. We sailed out a bit to get to clear air, and then tacked over as well. Positioned for the upwind leg, we maintained our second place spot, covering against Marlen and Uproar while slipping a bit back from Jabberwocky. The breeze stayed fairly strong on this leg, and we approached the upwind mark with Marlen and Uproar hot on our stern. What is hot on our stern exactly? In this case it means if I stood on our swim platform and reached back, I could almost touch the bow of their boat. Was exciting stuff. We had a little challenge at the upwind mark. During the pre-feed as we approached the mark (when we pull out some of the chute to make it easier to set), the breeze (very strong at this point) pulled the foot into the water. If you’ve ever seen this happen, you would know it is very, very bad. Once the sail gets water in it, it is sucked down and generates huge drag on the boat. I was pretty sure we were a gonner at this point. I wanted to jibe as soon as we could, but didn’t think we had room. We finally got the chute and pole straightened out and had the sail filled. Then we got our third piece of luck. Marlen came up a bit giving us just enough room to jibe over. We went and they immediately followed. After a great jibe, Jim trimmed hard as we came up and squirted out from under their wind shadow. Phew! Very close thing there. Could have put us in last place quickly. We were on the layline to the finish (meaning we wouldn’t have to jibe again to cross the line), in clean air and covering Marlen and Uproar – life was good. Surprisingly, it got even better. Working up to build speed and then down to surf waves, the current helped us as we sailed deep towards the finish line. 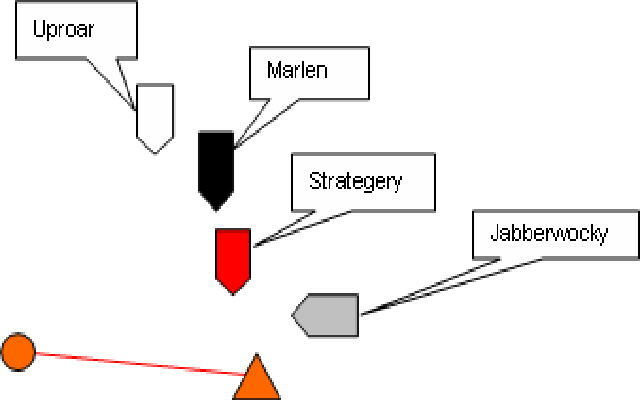 The order at this point was Jabberwocky, Strategery, Marlen and Uproar. While we were struggling with our chute and tactically dealing with Marlen’s threat, Jabberwocky had chosen to sail a higher, hotter, faster angle downwind. This put them far ahead, but in need of jibing to reach the finish. They waited until the finish line to jibe, which ended up costing them the race. Had they jibed sooner, they could have covered us and blanketed our air. By waiting until the finish line, they had to cross us and then jibe. If we were lucky (and this is titled 4 pieces of luck), we’d be able to take their wind and finish in front of them. Chris was the first one to pick up on this, and had us sail a bit hotter angle to pick up speed on Jabberwocky. Right on cue our fourth bit of luck came our way and it unfolded exactly as we hoped…they crossed, we drove right at the stern of the committee boat and as they jibed, and we rolled over them to a 1 second lead at the finish. What a race. The crew pulled it off by a hair. Was great fun…the best sailing yet.